#EarthHourPH2017 Set for March 25th - Hello! Welcome to my blog! With a new era of climate action underway, the World Wide Fund for Nature (WWF) again urges its supporters to switch-off and shine a light on climate action. On March 25, from 8:30 to 9:30 PM, Earth’s most iconic landmarks will once more switch-off their lights for Earth Hour 2017. Earth Hour Philippines’ main switch-off event shall be held at SM by the Bay, Mall of Asia Complex from 7:00 PM to 10:00 PM on March 25, Saturday night. This year, there will be an Earth Hour Camp starting at 4:00PM that will feature interactive climate adaptation and mitigation booths, specifically, native tree planting, renewable energy technologies, and disaster go-bag preparation. A large focus of #EarthHourPH2017 will be on galvanizing the youth to be the climate leaders of tomorrow. Members of our National Youth Council will lead the Earth Hour Camp while two new WWF Youth Ambassadors will be introduced along with the official WWF-Philippines song. “While the theme of Earth Hour remains at Shining a Light on Climate Action, we took to heart the role of the youth as the key to further propel the country into a climate-resilient one. We continue to engage and encourage the public to emphasize that together, we thrive,” says WWF-Philippines President and CEO Joel Palma. Last 8 March 2017 in Discovery Suites, Ortigas Center, WWF National Ambassador Marc Nelson and WWF National Youth Council Chairperson Alexa Cancio led the launch of this year’s Earth Hour celebration. With a sneak peek of what is to come, everyone was abuzz with the Earth Hour camp to be spearheaded by the youth, and a switch-off powered by human energy to light up an image of the Earth, proving that together, Filipinos can shine a light on climate action. The Philippines has been championing the switch-off since 2008 and has topped global participation records from 2009 to 2012 – earning it the title of Earth Hour Hero Country. Through the support of the Department of Interior and Local Government, the Leagues of Municipalities, Cities, and Provinces, the Metro Manila Development Authority, and other government partners, Earth Hour in the Philippines has always been a success with each year witnesses a growing multi-sectoral support system, proving that more and more Filipinos believe in the message of Earth Hour. This year’s event was made possible with the support of SM by the Bay, SM Cares, SM Supermalls, Philips Lighting Electronics Inc., Pure Energy Holdings Corporation, Summit Natural Drinking Water, Energy Development Corporation, Bambikes, Pivot Edutainment, Rock PH and Discovery Suites. WWF-Philippines also welcomes other supporters, encouraging them to to join this year’s Earth Hour to further amplify its power and reach. Social media users can promote their commitment to the planet by donating their Facebook feeds to spread climate awareness and action in a few clicks on earthhour.org/climateaction after 10 March. 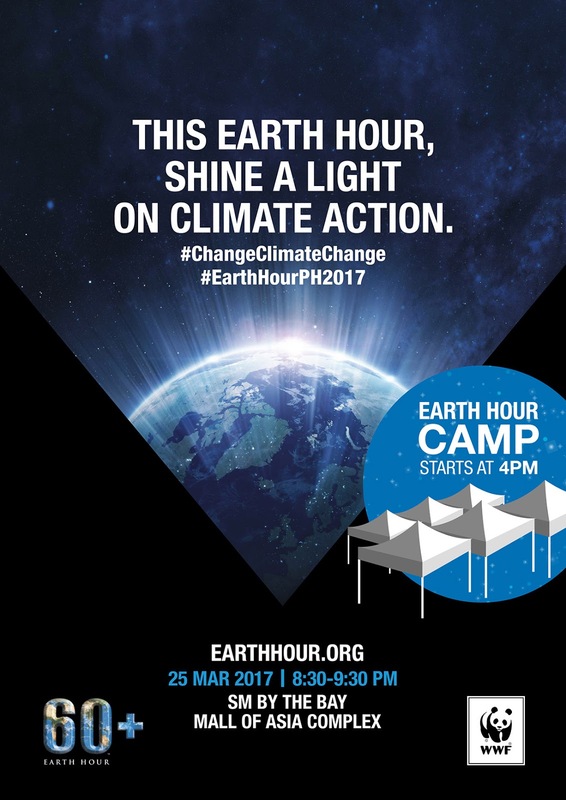 Everyone is highly encouraged to use the official hashtags, #EarthHourPH2017 and #ChangeClimateChange as well as to upload the best photo(s) of their event on to the official Facebook event page www.bit.ly/earthhourph2017_event.